The iconic, achingly beautiful flame red desert scenery of Wadi Rum in southern Jordan is no less jaw-droppingly spectacular today than it was when Peter O’Toole starred in the film Lawrence of Arabia (1962). Indeed it has presumably hardly changed since the petroglyphs, inscriptions and archaeological remains were created, when the first human beings occupied the area, some 12,000 years ago. Locally it is also known as the ‘Valley of the Moon’, presumably in respect to the stunningly clear night skies, which offer not only a phenomenal night time desert-scape during full moon periods, but also a clear horizon-to-horizon quilt of bright stars when not bathed in lunar light. 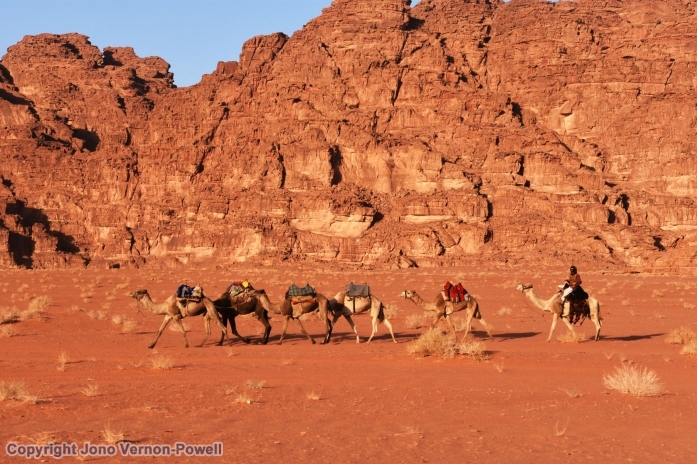 The whole of the 74,000 hectare Wadi Rum UNESCO Protected Area is one of Nomadic Thoughts’ ‘must visit’ Middle Eastern destinations. No more so than now, with visitor numbers relatively low and the perfect time of year, climate-wise, approaching. The remoteness of this desert region (60kms from Aqaba, on the northern tip of the Red Sea) contributes to the sense of outlandish wilderness, with its enormous swathes of red rock and sandy valleys, punctuated by parched desert bushes and endless mountains. The most impressive of these, Jabal al-Mazmar, is also known as the ‘Seven Pillars of Wisdom’, after Lawrence of Arabia’s book. Sometimes the mountains, disappearing into sandstorms in the distance, look like ships heading into fog. 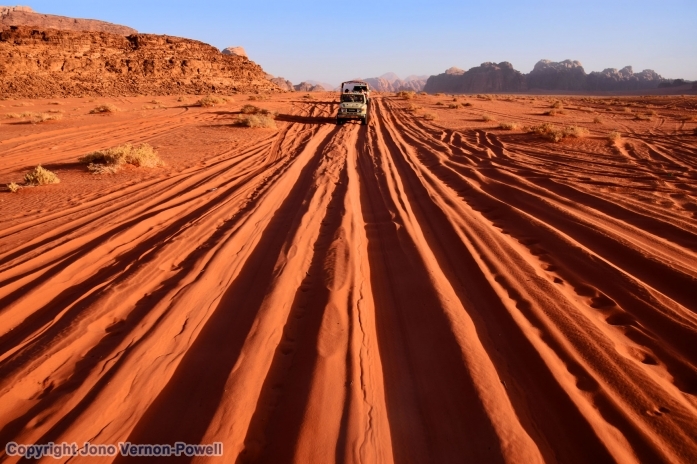 I first visited Wadi Rum in 1996. My wife and I, armed with 4 gallons of water and covered head to toe in loose fitting garments, strode out across the desert to circumnavigate the Seven Pillars mountain massif. A trip that on the face of it looked easy enough, but in reality was not only a physical challenge, but also a mental one. Not least as we did not have a guide, map or escape plan. The local Bedouin had advised us that the walk should take eight hours. “As long as you keep the mountain close to your right hand side, you will arrive back where you started”. Simple in theory, difficult once your imagination and curiosity get the better of you. From the moment we departed, the deafening desert silence was as loud as the sun’s furnace blast was hot. Slowly walking westwards, with the precious mountain to our right, we felt a constant building of excitement, matched with a sense of impending doom, as if we were climbing a high mountain ridge, or navigating a rough stormy sea. The silence, the difficult-to-define distances, the complete lack of any other living creature above ground and the sense of perpetual time-drift, meant that we were soon concerned that we were lost. The clear desert air meant that our mountain looked as close as all the others – even if they were tens of miles away. Without a guide our concentration levels stayed on full alert as we continued further and further away from civilisation – in this case the outpost that is the Bedouin settlement, adjacent to the fairly nondescript Visitors Centre. The desert, while first appearing harsh and unforgiving, soon wrapped us in its beauty: crystal clear flat pan valleys, tall sand dunes, monumental sandstone rock precipices all gave us the impression that we were on Mars. By the time we realised we had travelled too far to return the same way before nightfall, our eagerness to complete the circumnavigation of this colossal lump of rock took on a new focus. We climbed the far sided sand dunes, which in turn gave us access to rock caves with birds-eye views across the sprawling desert below. 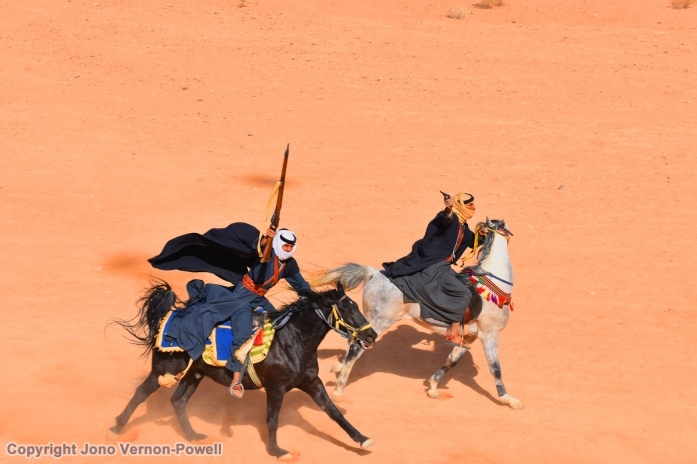 The region today offers terrific desert exploring opportunities, all run by the local Bedouin, whether camping, camel trekking or taking a jeep safari. In addition rock climbers can delight in all manner of mountain challenges. 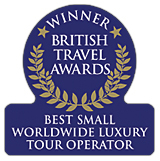 My top tip: if possible stay in one of our chosen desert camps. From there you can truly experience the remoteness of the desert, and enjoy to the full what will be an unforgettable night sky.